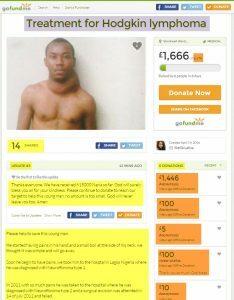 Please help to save this young man. He started having pains in his hand and a small boil at the side of his neck. we thought it was pimple and will go away. Soon he begin to have pains, we took him to the hosptal in Lagos Nigeria where he was diagnosed with Neurofibroma type 1. In 2011 with so much pains he was taken to the hospital where he was diagnosed with Neurofibroma type 2 and a surgical excision was attemted in 14 of july 2011 and failed. After that a CT scan of the neck shows anterior neck mass that is prominently on the left. The mass is bulky, lobulated and has septal enhancement. The mass extend superiorly to the angle of the mandible with intra-thoracic extension. The dianosis is Hodgkin Lymphoma. The hospital in India has accepted to treat him, the cost is £17000 for 8 months treatments for operation, chemotherapy and radiotherapy. 1. Massive Neurofibroma mass extending from the posterior triangle to anterior triangle of the neck with adherence of mass to platyna muscle and Subclavian Vein. 2. Attempt at complete excision was made, but patient bled profusely and had to be transfused with 10 units of blood to sustain him. 6. At review in the clinic, he was noted to have residual neurologic deficit with winged scapula on the left side. Everyday his mother crys, looking for people to help her son for the treatment, we all are afriad not to lose this wonderful young man. No matter the amount, every little helps. Thank you so much for being so kind and God will be kind and helper to you too for being this young man helper.